Happy Tuesday – everyone, please stand up and stretch – it’s Tuesday Stretch with Cal. I’m continuing with beverage sets. Last time we talked about and looked at Imperial’s Chesterfield sets. Tonight we are on to Northwood. (We skipped Lancaster and Jeanette because they didn’t make beverage sets in stretch glass, to our knowledge.) Northwood made two beverage sets; both should be familiar to everyone reading the mail tonight. The most common set is the Diamond Optic set. 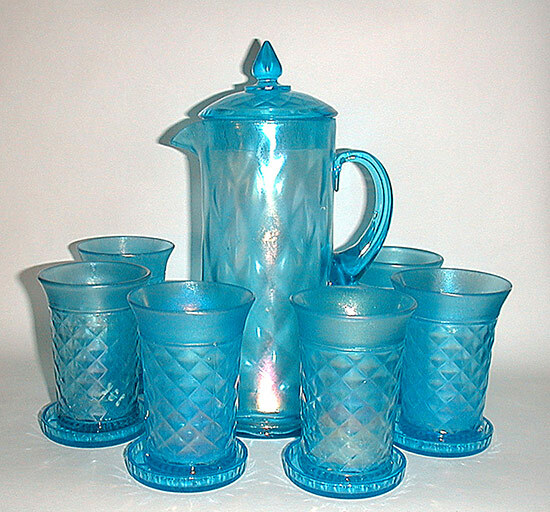 I know of it in Blue, Topaz and Russet – yes, both a pitcher with cover and tumbler exist in Russet. I’m not sure how many Russet pitchers are known; I have one; it is cracked. It has been that way for many years. I purchased it from Bill Crowl; he had peddled it to several other stretch glass collectors but no one wanted to buy it because of the large crack. I decided it would be better to have it with a crack than to not have one at all, so I became the new owner of it. I’m still looking for a tumbler to go with it. There is at least one tumbler known because Dave has a picture of it. 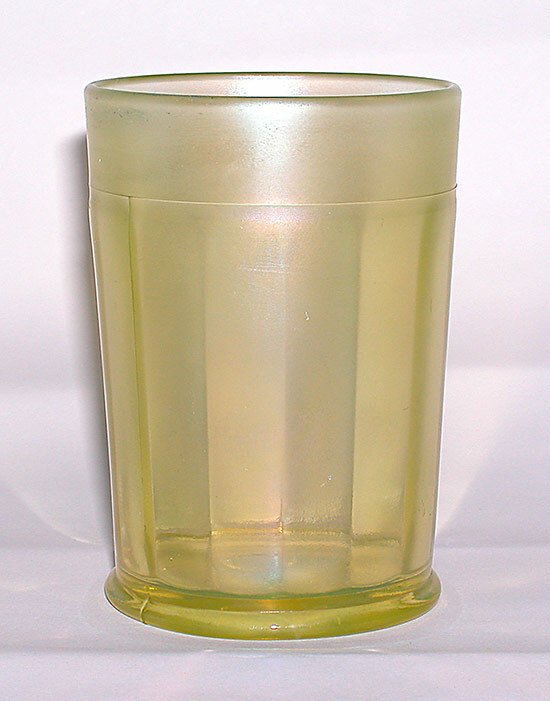 Maybe some of you have Russet Diamond Optic tumblers? If so, we would love to know about them. Northwood made matching coasters for the blue and topaz sets (the coasters are not iridized). I’ve not seen or heard of a Russet coaster, but they could exist. The Diamond Optic pitcher should have a cover. I’ve seen more pitchers than covers, so I suspect there are some cover-less pitchers in collections. The set consists of pitcher, cover, 4 or 6 tumblers and an equal number of coasters, making it either 10 pieces or 12 pieces. In my years of collecting, I have seen many more blue sets than I have seen topaz sets. 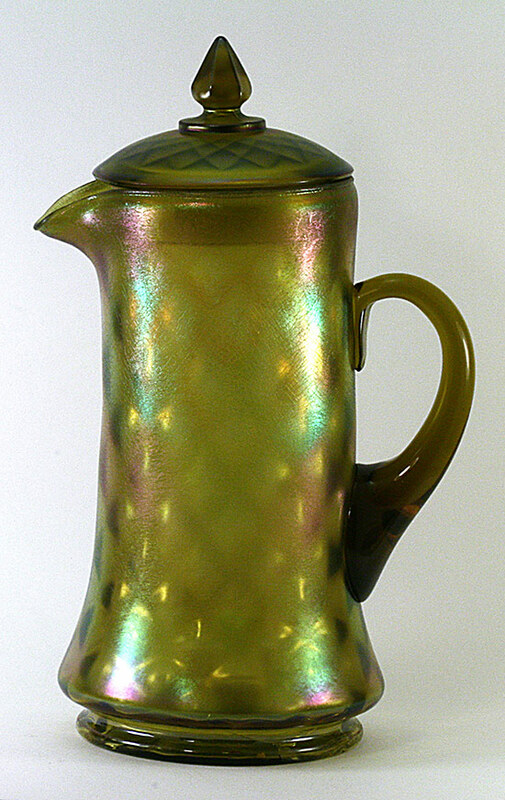 The pitchers are especially difficult to find in Topaz. And…..Northwood made a black base for the pitcher to sit on. It is a different size than the black bases for their bowls; this is not to say that one of their many bowls might not fit on this base, but as I understand it, the base was made for the pitcher. Topaz coasters are almost as hard to find as the topaz tumblers, which are slightly easier to find than the pitchers. The second ‘set’ Northwood made is known as “Barbella.” Again, you probably are aware of it; I believe Barbella tumblers are to be found in some carnival glass tumbler collections. Barbella is a pattern which features optic rays or panels. These appear vertically around the tumbler. There is a band at the top of the rays. I have heard of – and I believe I once saw a photo of – the Barbella pitcher. I don’t have the photo to share with you tonight. 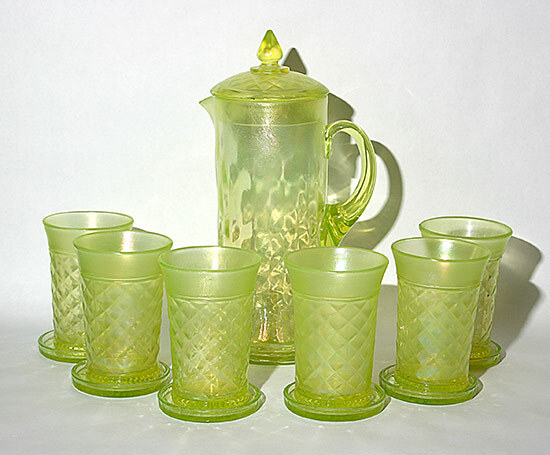 Maybe one of our readers is the lucky owner of this set; if so, we would greatly appreciate a photo of the pitcher or the entire set. 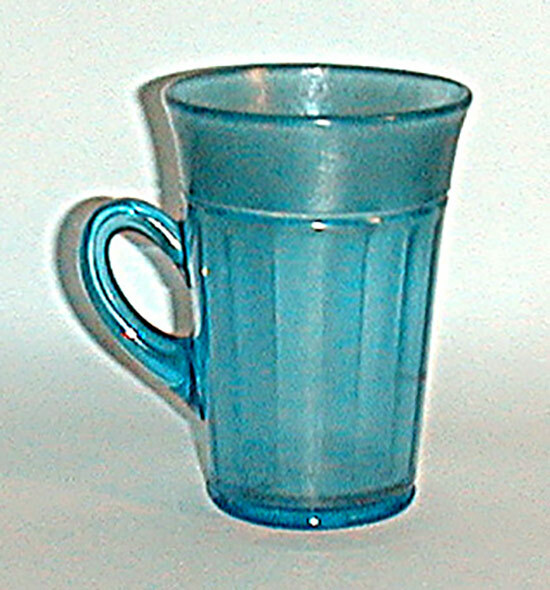 Barbella tumblers are known in topaz and Russet; I am not aware of one being known in blue. My experience tells me that these tumblers are hard to find, very hard to find. Having said that, I now have three topaz tumblers, so I am half way to a set of six. I have never had the opportunity to buy the Barbella pitcher. Maybe I will find one someday. I was fortunate to find one Barbella Russet tumbler. My sense is that they are much harder to find then the topaz ones. 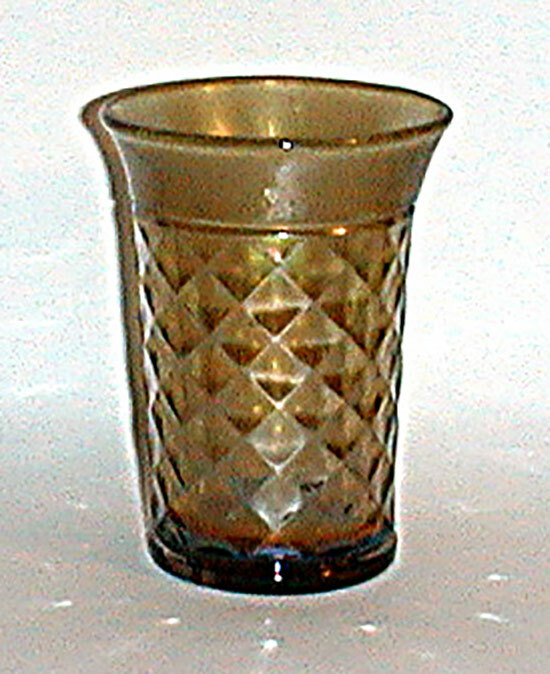 It is interesting to note that in this form, there is not a lot of difference in color between the topaz and Russet tumblers. I suppose if you get them under intense, perfect lighting, there would be a noticeable difference, but in my display case, that is not the case. I would be very interested in hearing from anyone who has Barbella tumblers or a pitcher, so if you have one or some, please snap a photo and share it. One additional note on Barbella. (these photos are coming in a separate email) There is also a covered sugar, creamer and spooner known in topaz Barbella. One might ask where is the butter dish to complete the table set? Maybe it is out there and we have just not found it. Or maybe they made only the sugar, creamer and spooner, expecting them to be used at afternoon teas, and so no butter dish was needed. The covered sugar, creamer and spooner are also quite hard to find; if you have the complete set, consider yourself very lucky. 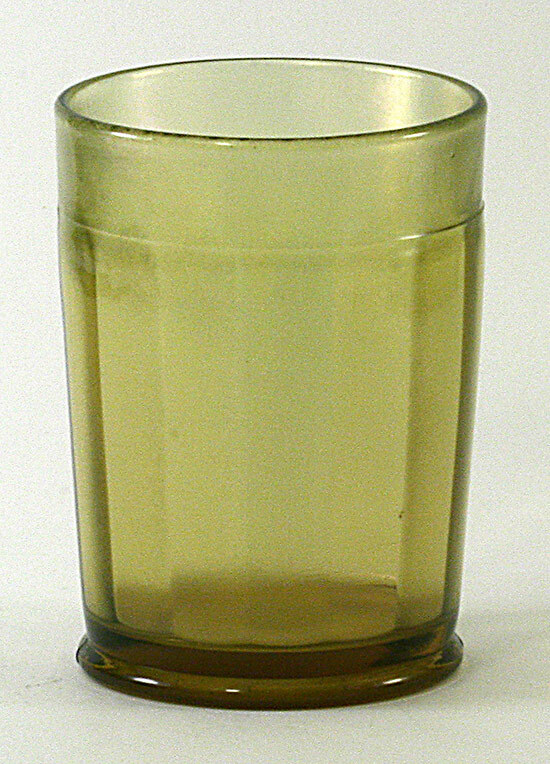 Northwood also made a handled tumbler, # 688. It looks similar to Barbella, but I don’t believe it is an exact match. I’ve seen more of the handled tumblers without iridescence than I have with iridescence, but even without iridescence they are fairly scarce. Ok, that wraps it up for pitchers and tumblers except for the ones for which we have not been able to identify the manufacturer (or that we are not aware) because US Glass and Vineland did not produce pitchers and tumblers to our knowledge. Maybe you have some stretch glass pitchers or tumblers you would like to share with all of us? We would be excited to find that some exist of which we are not aware. I’ll put in a quick reminder of our upcoming 2018 convention. We will be in Marietta, OH on July 25-26-27, 2018. Wednesday is set up day, concluding with a reception on Wednesday evening. Thursday and Friday are filled with seminars and some free time for shopping or resting. Thursday evening Steve Lindquist and Gary Sullivan will be our banquet speakers. Their presentation is titled, “ A carnival glass collection stretching out” and we know it will be fabulous. Friday night Tom and Debra Burns will present an auction of stretch and other glass. There are sure to be some surprises on the auction block that evening. Last year their auction included one of the few known Fenton Cobalt stretch glass “Florentine” candleholders. They always have something ‘rare and unusual’ as Bill Crowl used to say. We welcome you to join us for our convention; most of our events are open to members and guests. The banquet meal requires an advance payment, but you are welcome to come in after dinner to hear Steve and Gary’s presentation without buying a banquet ticket. All information is on www.stretchglasssociety.org; you can even register and pay on line! Let me know how I can help you join us.